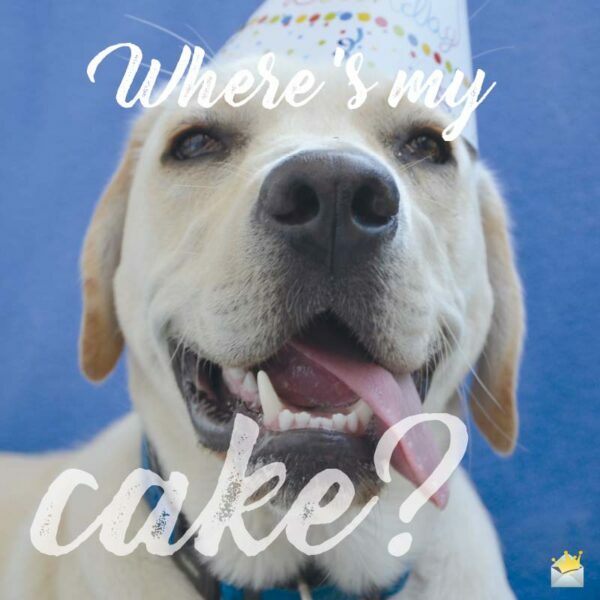 We are glad your search for great wishes to celebrate a pup or dog’s anniversary has landed you here! Our collection is filled with a wealth of 100% original and well-written birthday wishes for dogs. From status updates for your beloved canine friend to birthday wishes for a friend’s adorable furry buddy, we’ve got it all right here! Peruse the list below and pick any that grabs your attention. One of the greatest happiness of my life is a year older today! I would like to invite all my family and friends to join me in celebrating the birthday of my dearest DOGSNAME. My dog’s birthday would have been certainly incomplete had I not announced it on here for the whole world to see. Thank you, DOGSNAME, for bringing so much light and bliss into my world. 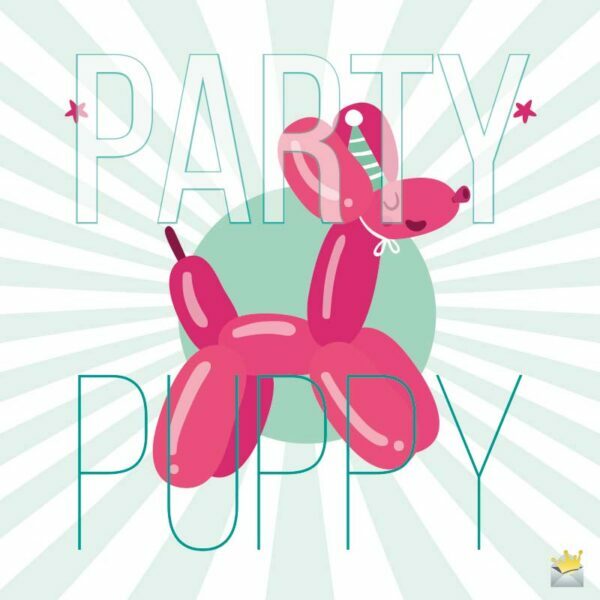 On this day, a big source of my happiness was born – DOGSNAME. Happy birthday. It’s absolutely amazing to have an amazing dog like DOGSNAME in my life. Happy birthday DOGSNAME! A big shout out to my wonderful dog for making my life truly fabulous! Happy birthday, DOGSNAME. Happy birthday to my dear DOGSNAME – the most adorable dog in the world! Thank you for making me smile again! Today, I dedicate my entire Facebook status to one of the loves of my life, my adorable DOGSNAME. Without question, you are one of the most awesome gifts I have ever received. Happy birthday! Happy birthday! Another year older! Another year more wonderful. Your birthday is nature’s way of telling me to shower you with extra pampering. And of course you can count on me to do just that! Wishing a fantastic birthday to my darling DOGSNAME. My love for you comes with no date of expiration. It shall remain in my heart until the end of my life. No matter how grey my skies become, my sweet dog always comes up with a million ways to uplift my spirits. Happy birthday to you, my dearest DOGSNAME! I never knew that this heart of mine could show an animal such an extraordinary amount of love and affection until you came along and melted my heart in a truly special way. Happy birthday. DOGSNAME, on your special day, I have only one special wish for you. May your heart always be a vessel that contains happiness. Every single dog on this planet has its special day. Today is yours. I promise to make it is as beautiful as your presence is in my universe. Happy birthday! A very fabulous happy birthday to one of my best friends ever, DOGSNAME! Thank you for making my life an awesome journey. My life wouldn’t be as beautiful as it currently is if God hadn’t blessed me with an amazing pet and friend like you. Happy birthday. For me, it’s a blessing to have a dog as special as DOGSNAME in my life. Folks, please join me in wishing my adorable dog a happy birthday! Happy birthday to the world’s sweetest dog! Thank you for making even the saddest days of my life bearable. Thank you, buddy, for not only being faithful to me but also for loving me unconditionally. You’re the best. Happy birthday! For making my life a blessed and happy one, I promise to make your life as happy as you make me feel. Words can’t express how important you are to me. Happy birthday. 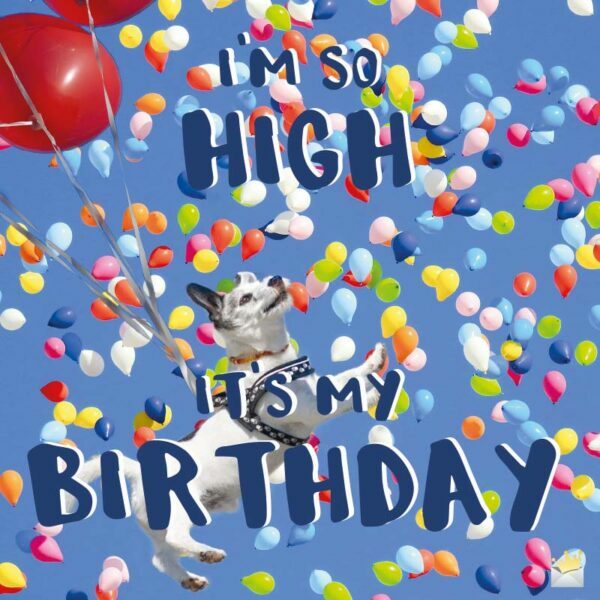 I’m so high, it’s my birthday! DOGSNAME, in the eyes of the world, you are just an ordinary dog. However, in my eyes, you are an extraordinarily special angel and friend. Happy birthday! DOGSNAME, the joy you bring me is heavenly. Since today is the day you officially started your earthly journey your birthday, I promise to make you the happiest pet in the world by doing everything that you like, including giving you a ton of treats and petting you on the spots where you enjoy being petted the most. Happy birthday! Happiness is being blessed with a lovable dog like you, my dearest DOGSNAME. Have yourself a truly joyful day on your special day. After a hard day’s work, you, my dearest, are one of the first things I love to see. No one has the ability to make me forget my worries and struggles in life like you do. Happy birthday! The sound of your bark is the sweetest melody I’ve ever heard. Happy birthday. Wishing a super duper happy birthday to my sweet DOGSNAME. An absolutely adorable dog like you has more worth than all the fortune of this universe. I love you so much! I experienced true happiness for the first time in my life the very day my beloved dog came into my life. Happy birthday, and thank you for never getting tired of filling my soul with gladness. DOGSNAME, one of the most heartwarming expressions of love I have ever seen is how you wag your tail when I come home from work. You deserve the whole universe for being so wonderful to me. Happy birthday! You are one of my best companions in this world. The happiness you bring into my heart is so limitless no amount of money in this world can ever buy it. Happy birthday, my beloved dog! You make my crazy life a more meaningful and colorful one. In my eyes, you are more of an angel send from above than you are a dog. Happy birthday! Buddy, thank you for never judging me. Thank you for always showering me with the purest forms of love and happiness. I will definitely have an unfillable void in my soul in a world without your companionship. Happy birthday! I’m elated to hear that today is the Big Day of your adorable dog. May happiness and good health accompany her/him all the days of her/his lovable life. Sending the heartiest wishes to you on the birthday celebration of your dog. May joy and beautiful things surround the life of DOGSNAME. Today is a special day because it’s your dog’s birthday! May he continue to be happy and bring you all the joy you deserve. Please, send this heartfelt birthday greetings to him on my behalf. Today, I wish your amazing dog the best of birthdays! May he/she always be full of happiness and good health. Wishing a day so fabulous that our dear DOGSNAME will remember it always. Happy birthday, DOGSNAME! May all the happiness in the world fill the brave heart of DOGSNAME as she commemorates her day of birth today. You are certainly a lucky person to have the company of such a wonderful dog. Wishing DOGSNAME an absolutely happy birthday. I hope that his birthday is as wonderful as he is to you! Yay! It’s the birthday of DOGSNAME! For being such a cutie, she deserves only the most beautiful things in the world…on this special day and all year long! DOGSNAME is certainly one of the most adorable dogs I have ever known. And you, my friend, are so lucky to have her in your life. I wish her a great birthday filled with all the things in the world that make her happy. May your beloved DOGSNAME be blessed with a life filled with loads of fun as he/she commemorates the day of her birth. May he/she continue to make your home a very happy place. Happy birthday to one of your favorite buddies in this world! May his special day be loaded to the brim with hours upon hours of happy barks, joyful plays and delicious treats. You both make a great team! Wishing your phenomenal dog a phenomenally beautiful birthday celebration! He/she deserves nothing but a day filled with absolute fun for being an extraordinarily amazing friend and protector. Happy birthday to your super adorable furry companion! On her Big Day, it’s my prayer that her heart will always know and feel happiness. No matter which angle I look at it from, DOGSNAME is a remarkable blessing in your life. He not only keeps you company but also fills your heart with joy. As he celebrates his birthday today, I pray that he is blessed with strength and good health so that he may continue to make the world a better place for you and all who love him. Since happiness is the most important thing in this world, I pray for nothing but utter happiness for your darling four-legged friend. May he/she have an ocean full of happiness not only on his/her birthday but forever. Happy birthday to your loving furry canine friend! May her birthday bestow upon her an abundance of the things she loves the most. Today is your lovely dog’s birthday – the day she has the right to be treated like a princess. May happiness always find her wherever she goes. Here’s to your beloved dog’s special day! May he/she get all the things his/her heart truly wants. Happy birthday to a wonderfully beautiful dog named DOGSNAME who keeps getting beautiful and beautiful every year. May all the things that make her happy make a path to her world. Hurrah! Today is your furry buddy’s special day. I hope this beautiful day is packed brimful with joy, good health and a mountain of treats. DOGSNAME is absolutely special. I hope he/she has the most fun of birthdays so far. And I trust, you, my friend, will make sure that happens. Wishing your darling DOGSNAME a very, very fun birthday! She might have become a year older today, but she’s still as adorable as ever.